DirectLink technology: Provides dedicated control surface functionality that automatically maps keyboard controls to common mixer and virtual instrument parameters, giving users hands-on control over their mix and their music, without any complicated set up or user configuration required. DirectLink works with popular DAWs, including Pro Tools, Ableton Live, Apple Logic Pro and Steinberg Cubase. 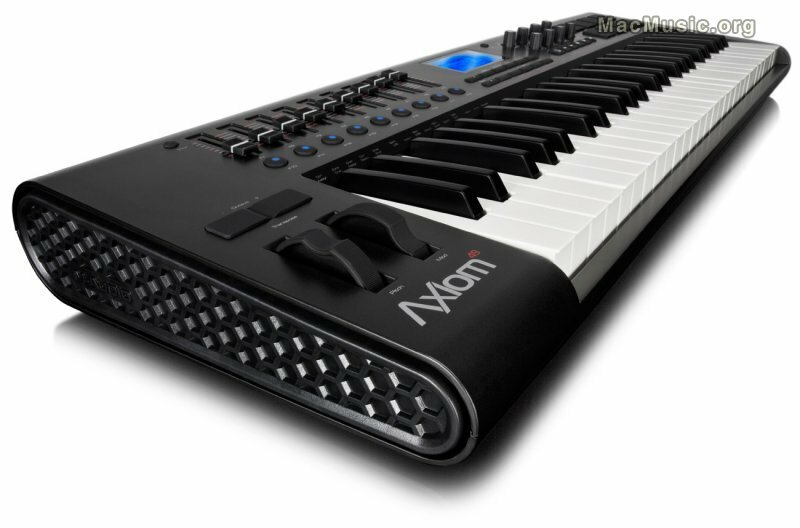 Enhanced keybed: An updated semi-weighted piano-style keyboard delivers a musically satisfying playing experience—ideal for playing software and hardware instruments. Redesigned user interface: Offers better ergonomics for the studio and stage with an angled top panel that makes controls easier to access and view in any environment. New low-profile mixer-style faders (Axiom 49 and Axiom 61 only) enable a hands-on mix experience, while smooth rotary encoders provide precise control over software and MIDI parameters. All models provide informative feedback via a graphic LCD, which is centrally positioned on the Axiom 49 and Axiom 61 for easy viewing. The Axiom 61 is priced at 360€, the Axiom 49 at 320€ and the Axiom 25 at 230€. Products are available in EMEA from September 2010.